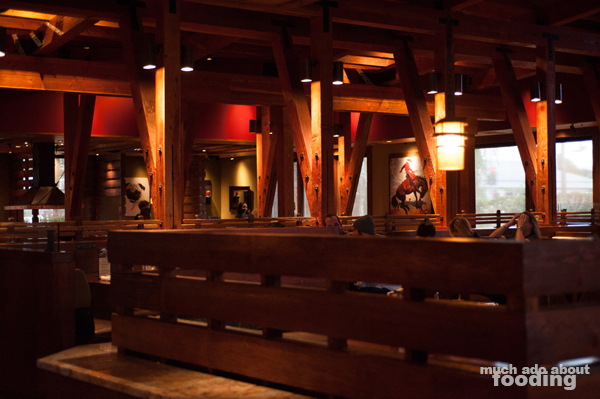 I have generally fond memories of visiting Lazy Dog Restaurant & Bar back in the day when I was first starting my foray into eating out (end of high school, start of college days). Prior to that, home was where the food was...for the most part. My friends and I enjoyed eating there because their appetizers were always solid and consistently good; the price point was not too bad either. Their menu also featured a variety of styles, and when you're with a group of people, it's always good to have options. 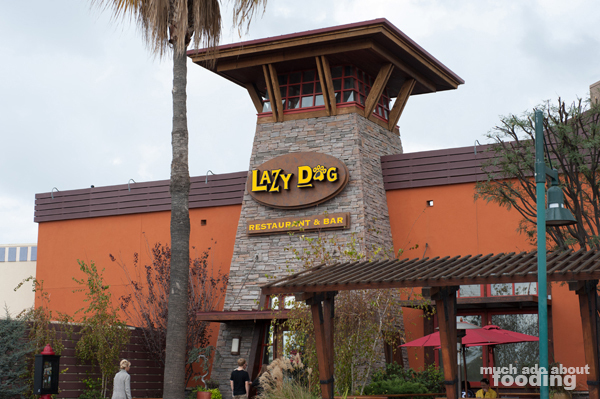 Fast forward a few years from then and it looks like Lazy Dog hasn't given up on the concept of having something for everyone. 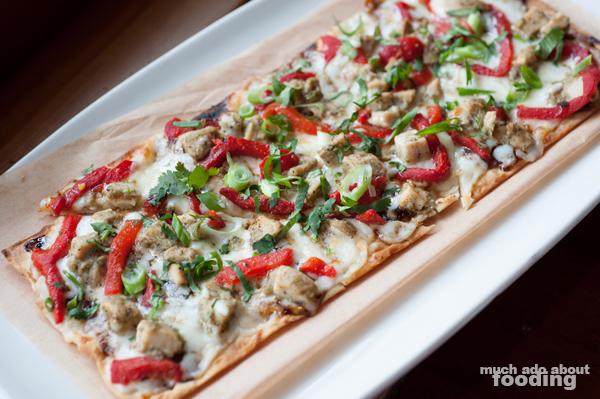 The menu spans noodle dishes to flatbreads to burgers/sandwiches and so forth. It also features items that have been guest favorites for years and has managed to keep up the consistency. Recently, the restaurant group added a Nutritious & Delicious section to their menus, and we were invited in to give it a try. Not only that but with the Girl Scout cookies season happening, we also grabbed ourselves a limited-time-only Thin Mint Shake available until March 25th! The Nutritious & Delicious menu is not limited to just food items; there is a subsection for "Clean Cocktails" so my curiosity ended up ordering me a Pom Margarita ($7.25 - Sauza tequila, 100% pure pomegranate juice, housemade sweet & sour, and a black sea salt rim), clocked in at 147 calories. It has a unique presentation because of the black sea salt rim but that didn't add much to the drink which ended up being too flagrant on the alcohol and less so on the juices. It was not as balanced as we would have liked but might work for others who seek out the tequila in a margarita. What really did satisfy was our tall glass of Lazy Dog's Thin Mint Shake ($4.95 with $1 benefiting a local Girl Scouts troop), definitely not an item on their nutritious menu by any means. This thick, delicious shake had plenty of Thin Mint cookies crushed into it, giving off that iconic peppermint chocolate taste with texture to boot. It felt like a meal in itself! We enjoyed the whole Thin Mint cookie on top as well as an added bonus. 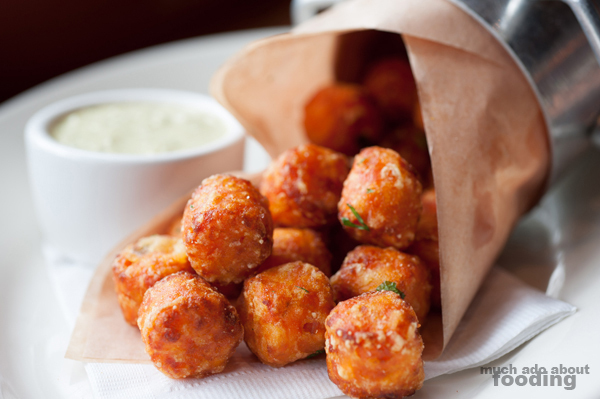 Off of the regular Starters menu came a bucket of Sweet Potato Tater Tots ($4.95 - served with roasted jalapeno-lime aioli), perfectly shaped morsels of fried sweet potato. They were seasoned well on the outside and made exceptionally better once dipped into the spicy and tart aioli. The contrast of extremely crunchy on the outside with the sweet, smooth inside led to these tots being quickly chomped up with reckless abandon. 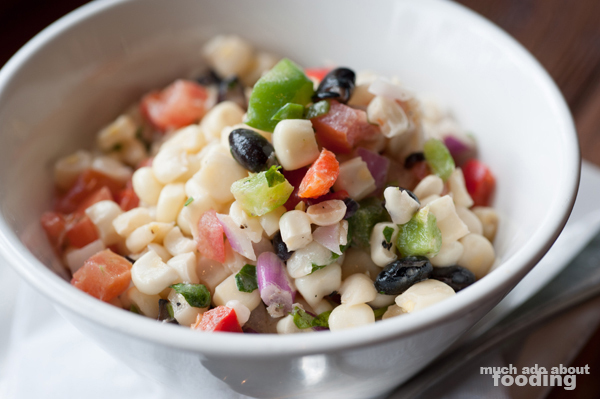 To combat having a fried appetizer, I ordered a side of their Sweet Corn Succotash Salad ($2.95) which was a favorite dish of mine back in the day. The order was just to see if anything had changed about the item at all; the verdict - not much. It was still as flavorful as I had remembered with a bountiful medley of vegetables. Have a bowl of this to make yourself feel healthier. Onto the actual Nutritious & Delicious menu! Duc opted for their Jerk Chicken Half Crisp ($8.75 - topped with jerk-marinated chicken, tiki sauce, mozzarella cheese, roasted red peppers, cilantro, chili flakes, and green onions), listed as 490 calories' worth, and I went for the Chimichurri Mahi Mahi ($14.75 - pan-roasted mahi mahi on a bed of black beans, sauteed zucchini, roasted red peppers, and onions topped with tangy cilantro chimichurri sauce and a pickled carrot, onion, and orange salad) which came in at 640 calories. The whole menu itself claims to have items worth less than 650 calories so the mahi mahi was just pushing it. Because of the menu's popularity and how plenty of customers order the items without care for their section designation, you can find each of the dishes also listed under the regular categories. 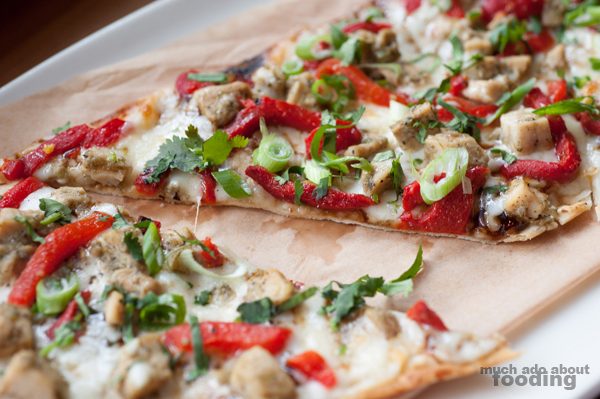 For example, the half crisp was also added to the flatbread section. If you order the half crisp, don't expect Jamaican jerk style chicken on top of it. That was our assumption but the listing was correct that the chunks were just jerk-marinated. The tiki sauce also tasted strongly like hoisin so what we expected for jerk chicken was more so like a Thai-inspired jerk seasoned chicken. However, the item itself was enjoyable and had plenty of greens to balance out the cheese and protein. The size also was fair for a single person and not over the top. My mahi mahi, on the other hand, was such a sizable portion for a single entree. It had a fine crisp to its outside from the pan-roasting, and the chimichurri was dandy. 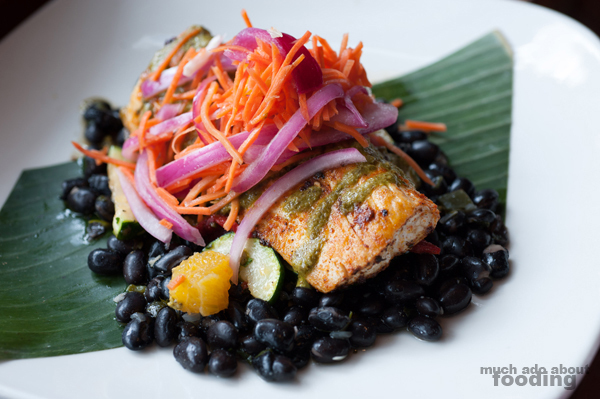 I did think that there were much too many black beans for the whole dish (they fill you up!) and the orange did nothing to advance the flavors. Overall, the dish looked healthy, tasted good, and was a nutritious balance so thumbs up for this inclusion on the Nutritious & Delicious menu. But of course, we could not leave without trying out a bit of dessert, and the Nutritious & Delicious menu didn't really have a selection like their typical round-up. 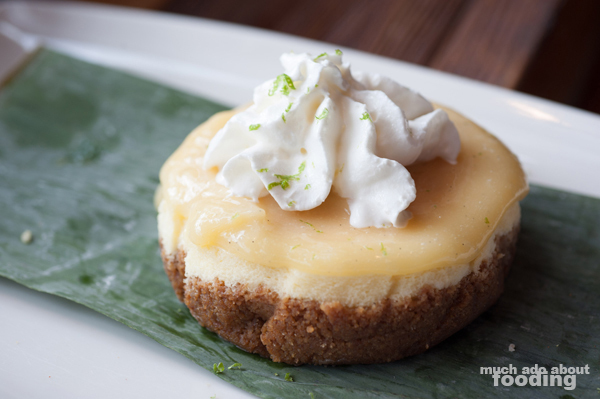 The Key Lime Cheesecake ($5.25 - housemade cheesecake with graham cracker crumble crust topped with key lime curd, whipped cream, and lime zest) called our names so we grabbed a pat of this enticing new dessert. Let me tell you though - the curd is very, very tart. It will make your lips pucker but you will keep on eating. We found the amount of curd to be overwhelming though and ended up pushing some to the side to get at the cheesecake itself. This is certainly not a dish to be kept to one's self. All in all, the Nutritious & Delicious menu seems to be a good fit for the people who are more health-conscious these days but it also is not exclusive to those mindsets. There is enough variety on it, and not every dish is salad so people may find it quite approachable. 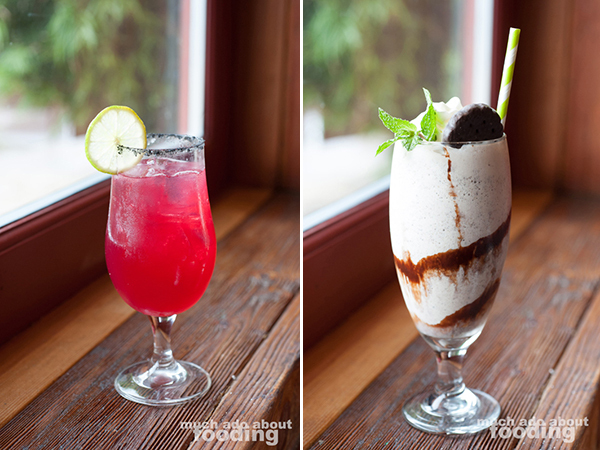 If you're not feeling like choosing from that menu however, make sure to grab yourself a Thin Mint shake before the 25th to go along with whatever you order!